If you arrive the evening before the event, come on down to the waterfront and join us for a sunset cruise. Look for the Bay Mist vessel at the Casco Bay Lines Ferry Terminal. The Monktoberfest is being held at the Portland Public Library. 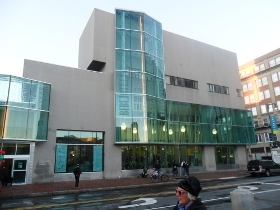 Located at 5 Monument Square in Portland, ME, the library is at the top of Portland’s famous Old Port district. Main track sessions will be held in the Rines Auditorium. We attend a lot of conferences; we know how valuable the face to face time is. For those that would like to meet more privately, or set up demonstrations of their projects, we have a variety of onsite meeting rooms set aside for that purpose. See one of our onsite organizers for details on booking these; they’ll be scheduled on a first come, first serve basis. We don’t disclose the dinner location in advance. In years past we’ve hosted in places ranging from barns to breweries to halls to nature preserves. We’ll provide more details at the event, and if the venue calls for travel we will provide buses to and from the library for attendees.